defend the seawall only to be overtaken by Jean Lafitte. There’s nothing like a good pirate story—or event—to lure me into driving two thousand miles. 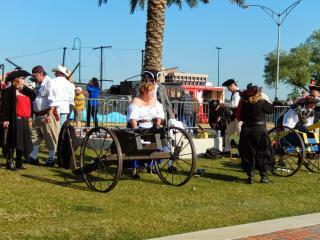 And Louisiana Pirate Festival in Lake Charles proved to be all I hoped for. I’ve always been intrigued with pirates, so much so that my grandson and I played pirates in our hot tub from the time he was two. Unfortunately, he always got to be the captain, and if I was lucky, I was the first mate instead of cabin boy. Both positions always ended the same way though—with a mighty splash as I walked the plank. So, I knew how the mayor of Lake Charles felt when “pirate Jean Lafitte” forced him to walk the plank! With the true head of the city disposed of, the pirates are in control for the twelve days (two weekends) of Louisiana Pirate Festival. And if there’s one thing pirates are good at, it’s throwing a party and having fun. We planned our visit to arrive in Lake Charles for the first weekend of Louisiana Pirate Festival, so got to take in the parade and the pirate “attack” on the city. Re-enactors, dressed in period costume, defended the sea wall with canons, while boats flying the Jolly Roger circled the bay. Once the buccaneers landed, though, it was all over, and we were on to the Civic Center to continue the fun. With a midway, lots of booths and Cajun food, plus bands on the outdoor stage, things just got better and better. The concert list for this year&apos;s festival, April 28-May 10, looks to be great with musicians like The Flamethrowers, Encore, Bag of Donuts, and Wayne Toups. Of course, during the day, we got to experience lots of Lake Charles culture too, from boudin balls and cracklins, to the Creole Nature Trail All-American Road and Mardi Gras Museum.